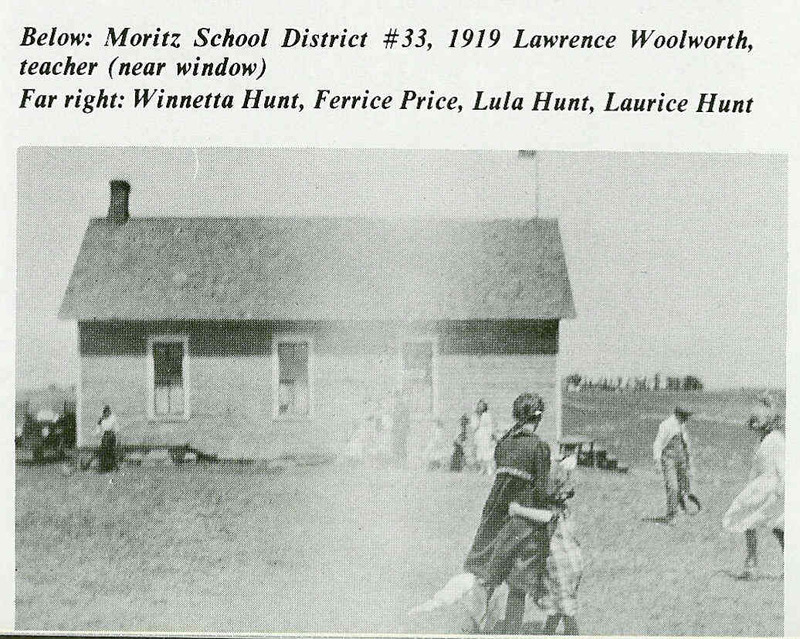 The families around what was later the town of Moritz made plans and organized District #33 on April 4, 1882. It was thought that in the beginning Mrs. Peachey may have taught pupils in her home and thereafter school was held in a building on the Peachey farm, one mile east of where Moritz was located. On May 15, 1883, school began with Hattie Wood, teacher, with an enrollment of 19 pupils. The last day of the term was August 3, 1883. The school board officers were: W. C. Sills, John Yetter, and J. Peachey. The teacher's salary was $24.00. A school building was finished in 1893 in what was then called the Cadwell District #33 and evidently painted red, for it was called "The Little Red School." At that time there was only a spring and fall term of school of about two months each. It was a very cold building with the wind often blowing in through the wide cracks between the floor boards and around the windows. Perhaps it was the discomfort of the pupils and the longer school terms around the turn of the century that led the patrons of the school district to deem it necessary to put up a warmer and more substantial building. On September 20, 1904, an acre of land was purchased from John and Augusta Rust, one-half mile north of Moritz. Upon a good foundation a new school building was erected with the required high ceiling, three full-sized windows on either side with a bracket wall kerosene lamp by each one, and a long wall blackboard in the front of the room. The teacher's desk, chair, and a wooden blackboard were brought from the old school house. The outside door led into an entry-cloakroom and a door from it led to a fuel bin on the north. Like most country schools it was heated by a soft coal stove. The fire had to be started each morning. While the purpose of the school was to educate boys and girls, the building was used for other cornrnunity purposes, too. From 1889, the school building served as a township hall and polling place for voting. Church services were often held on Sunday during the summer in rural school houses, and because there were ministers who were willing to drive out, folks within the district made use of the opportunity to hear the Word of God. As many as 35 to 45 persons of various faiths attended church and Sunday school there. Thinking that an organ would benefit both church and school, money was raised to buy an expensive organ. In our little country school house, the celebration of the birth of Jesus on Christmas Eve seemed the most sacred and most beautiful of all entertainments and was enjoyed by both young and old. Each fall a basket social was held to raise money to buy material for Christmas stockings and the "goodies" to fill each one. The pupils, under the direction of the teacher, practiced for weeks and presented a lengthy program, nearly all relating to the Christ Child but with some numbers of mild comedy to add a bit of mirth and merriment. After that, someone played Santa Claus and brought in the filled Christmas stockings to give to each child in the district. In later years the mothers sold lunches to earn money for the Young Citizen's League, using the money to buy library books, playground equipment, games, and so forth. Early day pupils carried their lunches in syrup pails. They didn't appreciate the plain bread and butter sandwiches without a drink to go with it. Dinner pails were kept in the cloakroom, but they were brought inside during cold weather. Later. thermos bottles could be purchased and either hot or cold beverages could be brought from home. When telephone lines were strung in the Moritz area and patrons of the school district had phones, a phone was installed in the school house. Through the years the school was updated; but in 1963 there was talk of consolidation. The last term, 1964-1965, was taught by Mrs. Dorothy Monson who had an enrollment of seven pupils. In June, 1965, the school was closed. The building was bought by Glenwood Township to be used as a town hall.